Also known as Friendship Sage, this is a big one with brilliant purple, tubular flowers. It can grow to an unruly 5’ X 5’ or more. A hard pruning after the last frost keeps it bushy. 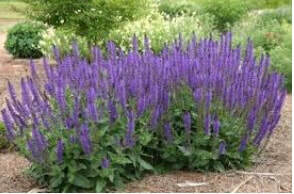 A more manageable 3’ X 3’ in size, the cobalt blue blooms on this salvia are held by black calyxes. There is a clump in the current color garden—a transplant from a property that flooded three times. A true survivor. It’s known by many names including Autumn sage, Texas sage, and Gregg Salvia. It produces intensely red tubular flowers that attract hummingbirds, butterflies, and long-tongued bees. It forms a pleasing mounding shrub of about 3’ X 3’ that benefits from the occasional trim. 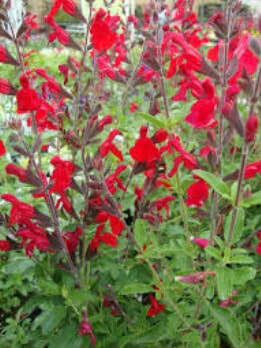 Salvia greggii come in a variety of colors. Native.